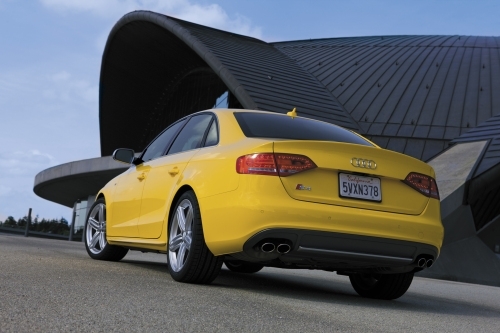 Now in its fifth generation, the 2010 Audi S4 is ditching V-8 power and getting back to its forced induction roots. Two cylinders, 1.2 liters and seven horsepower are being lost. But 23 lb-ft of torque, a twin-clutch automatic, supercharger and six mpg on the combined cycle are being gained, as is a more lively rear differential. The end result is a car that’s more efficient, lighter, quicker to 60 mph and genuinely throttle-steery, making this the first fun-driving Audi S-car in recent memory. Considering we’re huge fans of every single aspect of the current A4 aside from its affinity for understeer and exciting-as-vanilla four-cylinder turbo, we think the S4 provides the kick of excitement the A4’s competent chassis was begging for. Not only does it have the ergonomics and creature comforts to go toe-to-toe with BMW’s current A student in the segment, the 335i, its new engine and sport rear differential now mean it has the dynamic resolve to match as well. Get behind the wheel, turn in hard and give the skinny pedal a prod; the S4’s ample torque will swing the tail onto the same arc as the front wheels, instead of plowing you off course. These dynamics used to reside exclusively in Audi RS territory, but not anymore. Plus the car looks great, has a terrific V-6 howl and comes with plenty of standard features. We’re not missing that lazy V-8 one bit, that’s for sure. The extra slug of torque provided by the supercharger gives the S4 a prodigious midrange, and with maximum torque coming at just 2,900 rpm, the engine hardly needs to be revved to be felt. Interior fit and finish are up to typical Audi standards, which is to say, phenomenal. A bump in fuel economy is also a great selling point, as is the new dual-clutch gearbox, which has the refinement of a traditional automatic with the efficiency and excitement of instantaneous shifts. 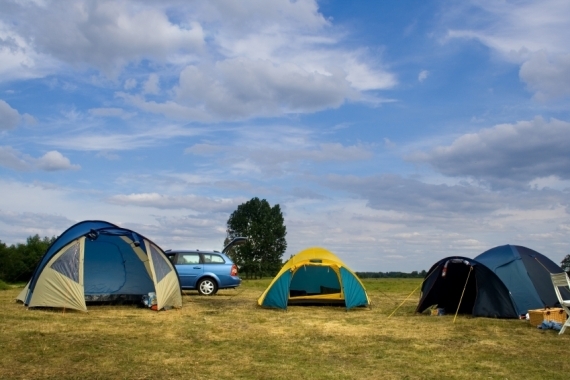 Why the sport rear differential is optional is beyond us. It’s arguably the largest mechanical upgrade over the previous S4 and a huge part of the car’s dynamic soul, yet it will set you back $1,100. The automatic S tronic dual-clutch transmission doesn’t come cheap, either. Before the RS4 and R8 came to be, Audis were typified by relatively conservative handling that was heavy on mild understeer, meaning if you approached a bend on the limit you were constantly winding on more lock and letting off the power to regain front traction. The new sport differential has changed the game entirely, and by speeding up the rotation of the outside rear wheel in a bend, enables the rear of the car to be steered with the throttle. What that translates to in plain English is a sedan that handles like a rear-wheel drive car, yet maintains the sensational grip of an all-wheel, giving drivers plenty of confidence to lean hard on the chassis and get on the power before apexing a corner. Midrange power is the engine’s strong point, and it doesn’t need to be revved to within and inch of its life like the V-8 of the RS4. For freeway driving, you can probably just leave it in top gear the entire time. Steering weight can be adjusted with Audi Drive Select, thought the comfort mode is hyper-light and dynamic mode comes across as too heavy, but it’s certainly closer to what we would consider appropriate for a European sports sedan. The S4 is powered by a supercharged 3.0-liter V-6 engine, which produces 333 horsepower and a punchy 325 lb-ft of torque that manages to disguise the bulk of the car’s all-wheel drive system quite competently. A six-speed manual transmission is standard, while a seven-speed S tronic dual-clutch automatic is available an option. Audi’s MMI system comes standard on the S4 and provides easy, digitized access to all the car’s functions, from stereo and climate control to Audi Drive Select preferences. Don’t think you’ll be browsing nav maps on it though – despite the screen being standard, standard navigation remains an extra. As we mentioned, the sport differential is a fantastic addition to the S4’s arsenal, offering all-wheel drive poise yet rear-wheel drive adjustability. Audi Drive Select controls the engine, suspension, transmission and steering characteristics of the S5 and has four modes: comfort, auto, dynamic and a customizable individual mode. This system allows the driver to custom tailor the responses of the chassis to any driving situation. Atypical of new models these days, the S4’s fuel economy actually gets a healthy boost over the previous generation thanks to a lighter curb weight, more efficient drivetrains and its new, boosted engine. 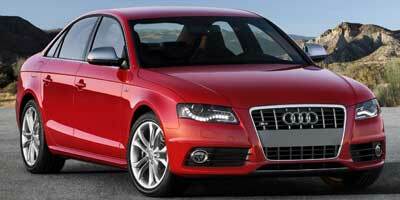 The manual S4 returns 18 mpg city, 27 mpg highway, while the S tronic manages 18 city, 28 highway. 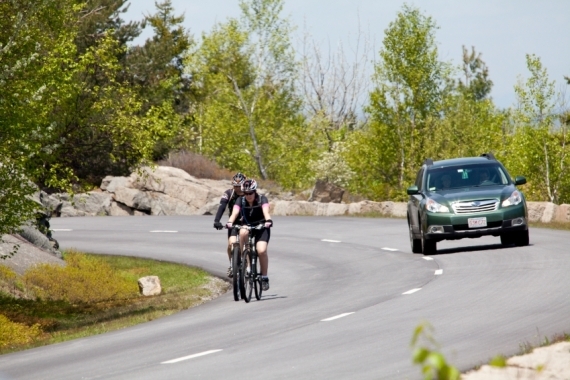 Both mark a significant improvement over the old car’s 13 city, 20 highway. 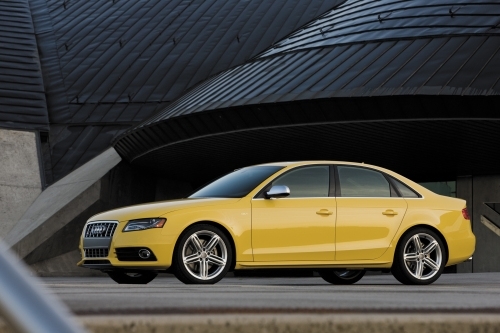 A wonder of ergonomic efficiency, the S4’s interior is a typical soft leather and suede Audi affair. There are a few S4 badges about, but generally it’s the same stellar cockpit featured in the A4, and that’s fine by us. As in years past, Audi hasn’t gone flamboyant with its performance model of the A4, instead opting to keep sporting visual cues to a minimum. Tweaked front and rear bumpers, side skirts, quad exhaust pipes, aluminum mirrors, an integrated trunk spoiler, 18-inch wheels and S-design grille encompass the subtle S-car add-ons. 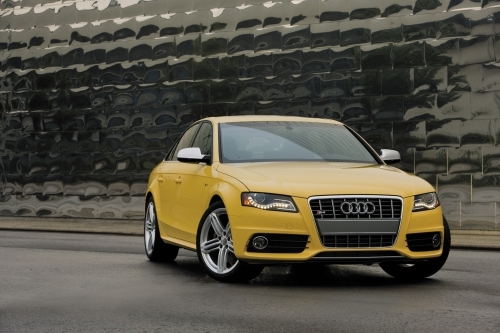 With an MSRP of $45,900, the S4 is a good notch up from the A4 in both capability and pricing. It comes in higher than the BMW 335i ($40,300) and all-wheel drive BMW 335xi ($42,300), but it also has more standard features. Other competitors include the Mercedes-Benz C350 Sport ($39,750), Lexus IS350 ($37,295) and Infiniti G37x ($35,750). BMW’s razor-sharp and brilliantly balanced 335i set the bar extremely high for the segment, but Audi has managed to build a car that’s just as brilliant in every way. Dynamic poise and a genuinely pointable chassis are paired with surefooted all-wheel drive, creating a confidence-inspiring blend. It doesn’t hurt that it has one of the best interiors in the business either. The S-car is back.